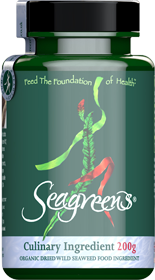 "One of my favourite ingredients, Seagreens®, is a UK produced wild wrack seaweed granule that has a complete nutritional profile, that is it contains all the vitamins and minerals the body needs. It adds texture, flavour and nutrition to just about any savoury dish you can think of. 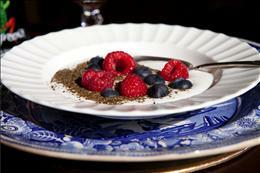 It is expensive, but you only need a little - one teaspoon per serving is ample"
You'll find Cacaomole, one of Kate's favourite recipes, on the Recipes page. 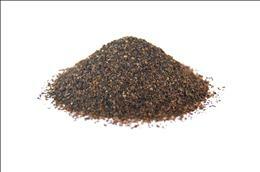 Use sparingly to add a highly nutritious taste of the wild to many dishes. Consumers describe “a subtle nutty taste and texture” in taste tests and half a teaspoon adds a comprehensive range of vitamins and minerals and will enrichen the flavour, for example of something as plain as broccoli soup. - Nigel Bardon, Maxim magazine, England, August 1998. In a family sized loaf add a level tablesppon and leave out the salt. Use it in seafood dishes, with bacon and eggs, in risottos and casseroles; sprinkle it on pizzas and among sliced potatoes and cheese; with baked vegetables; as seasoning in stocks and sauces. A baked potato filling becomes a nutritious meal, and if you're going to enjoy fish and chips, “pass the seaweed” is a must! 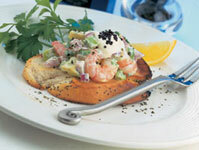 Toast Skagen - see the Recipes page! So easy to add to so many different foods!